The fish traders say that business is normal and that the only thing that has changed over the past year is their dependence on cash payments. MUMBAI: The fish market in Gawhan near Uran has a new look. A big canopy protects the 120 odd fish sellers from the elements. Business is growing with new colonies coming up in the vicinity, and there are jobs available for the youngsters of the community. The only thing that the fish women miss a year after demonetisation are the cash payments. “Business is normal. The only thing that has changed over the past year is our dependence on cash payments,” says Bebitai Mhatre. Bebitai’s family owns four fishing boats and her daughter-in-law Jignya is the sarpanch of the village. Yet Bebitai pursues her old profession of selling fish. She wakes up early in the morning and goes to the wholesale market of Mora, 20 km away, to buy fish as the catch arrives from the sea. She’s back in the village at 8 am and her fish are sold by noon. “Before notebandi all our transactions used to be in cash. Now, all of us have accounts in the bank. We deposit money in the bank every day and we pay the wholesale fish sellers by cheque. Only a handful of us who have very limited resources haven’t adapted to the new mode of transaction,” says Bebitai. 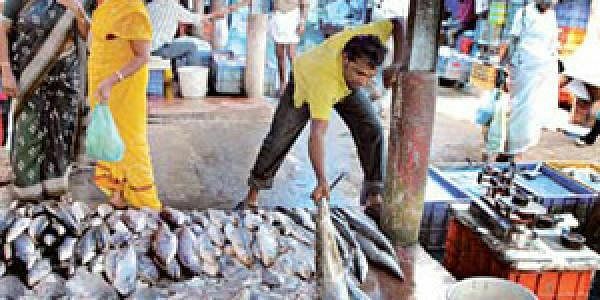 Shivdas Nakhwa, chairman of the Karanja Fishermen’s Cooperative Society, the biggest cooperative fishermen’s society in the area, said cheque payments have replaced cash in the fishing business in this part of Raigad district. “Currently we have over 500 boats registered with us and the yearly turnover of diesel and ice is more than `100 crore. Cheque payments have benefitted us immensely. It was a big risk to handle that kind of cash. But with cheque payments, I feel relieved,” he said.